Bulfinch Crossing is a 2.9-million-square-foot multi-phased development project that will replace the existing above-grade concrete Government Center Garage with six mixed-use buildings, a pedestrian-friendly streetscape and a public plaza on two appropriately-scaled urban blocks spread across approximately 4.8 acres. The demolition of a major portion of the garage over Congress Street will allow for daylight to shine on Congress Street for the first time in more than 40 years. The West Parcel will include a 45-story, 480-foot-tall luxury residential apartment building at 100 Sudbury Street, which will be the first structure built. The Phase I tower will feature 368 apartments and 55 condominiums for a total of 423 residences and will be followed by a 43-story, 528-foot-tall, 1-million-square-foot Class A office building known as One Congress on New Chardon Street and a 28-story building on Congress Street that will have apartments or condominiums. 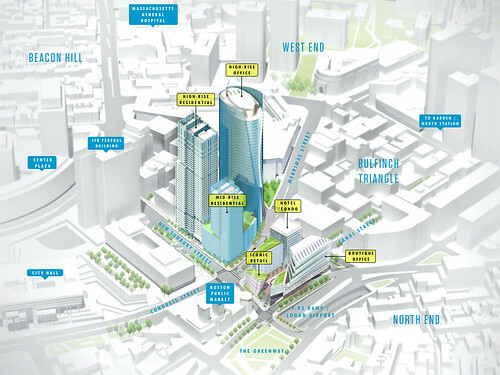 The East Parcel will include a nine-story wedge-shaped office building facing the Greenway, a small boutique retail building and a hotel/condominium building fronting Congress Street, all organized around a dynamic public plaza that will connect the Bulfinch Triangle neighborhood, the Rose Fitzgerald Kennedy Greenway and Congress Street. Facade install has started for the residential tower at Bulfinch Crossing. 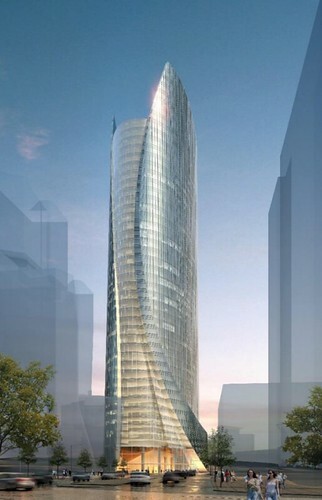 The elegant and unique "pin-striped" design for the tower was created by CBT Architects. The 45 story tower will include 486 luxury homes, 368 rental apartments, and 55 condominiums. Resident amenities will include a rooftop garden, sky lounge, a terrace with panoramic city views along with a fitness center and yoga studio. The first units at Bulfinch Crossing are expected to welcome residents in Spring 2020. State Street Corporation (NYSE: STT) announced today that in 2023, its new global headquarters in Boston will be One Congress Tower. 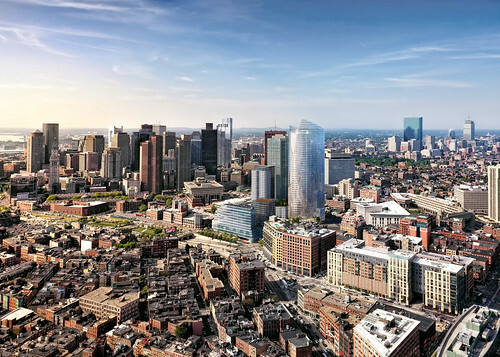 To be located at Bulfinch Crossing – a major redevelopment project in downtown Boston which will create six new high-rise and mid-rise buildings – One Congress will break ground in the summer of 2019. Designed by Pelli Clarke Pelli Architects, One Congress will have many attractive design and infrastructure features and will enable State Street to lower overall operating and occupancy costs and offer employees a working environment that will foster increased collaboration and productivity. As with State Street’s Channel Center offices, the building will be LEED (Leadership in Energy and Environmental Design) Gold® certified – an independent standard that verifies sustainable building design. As construction continues on the residential tower at Bulfinch Crossing a new permit has been issued for further demolition of the garage. This next phase will demo an 8-story parking ramp and also 2 floors of office space that sit on top of the garage. When all phases of Bulfinch Crossing are complete the project will total 2.9-million-square-foot of mixed-use space spread over six buildings. All the buildings will be situated around a dynamic public plaza that will connect the Bulfinch Triangle neighborhood, the Rose Fitzgerald Kennedy Greenway and Congress Street. Construction on the first phase, the residential tower is set to be complete in spring 2020. 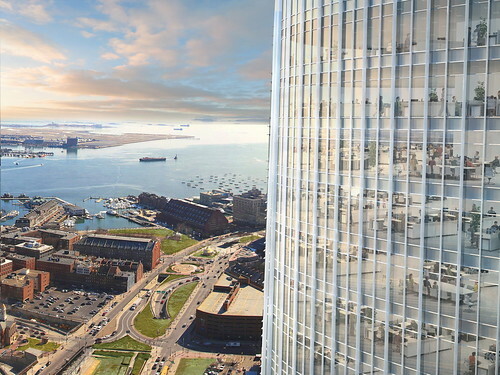 A plumbing permit has been issued for the Residential Tower at Bulfinch Crossing. The 45 story tower will feature 423 unit residential units ( a mix of apartments and condos). Luxury resident amenities will include a 9th-floor outdoor pool deck, 32nd-floor sky lounge, and top floor roof deck. First units at the project are set to be available in spring 2020. Framing has started for the 480-foot Residential Tower at Bulfinch Crossing. This first phase of the development will feature 368 rental apartments and 55 condominiums. The luxury building will offer resident amenities including a rooftop lounge and gardens. The first units are expected to be available in Spring 2020. The second phase of the project a 1-million-square-foot Class A office building known as One Congress is expected to be complete in 2023. Foundation work is wrapping up on the upcoming 423 unit residential tower at Bulfinch Crossing. The core of the structure is rising for what will consist of 368 apartment units and 55 for-sale condominiums on the top eleven floors. Amenities at this luxury building will include a state-of-the-art fitness facility, 9th-floor outdoor pool and pool deck, 32nd-floor sky lounge with sky terrace, 45th-floor roof deck, chef demonstration kitchen & dining room, children’s playroom, golf simulator, resident lounge/game room and dog spa. Representatives at HYM confirmed the building is on track for delivery of first units in spring 2020 with condo units to follow in early fall of that year. An electrical permit has been issued for 100 Sudbury Street, the west parcel of the project that will include a 45-story, 480-foot-tall luxury residential apartment building. This is the first structure built and will feature 368 apartments and 55 condominiums for a total of 423 residences. The building will replace the existing government center garage. with a total construction gross of 610 000 square-feet. The structure will consist of concrete core columns and post tension slabs. The exterior envelope will consist of glass and metal panel curtain-wall with a TPO membrane roof. 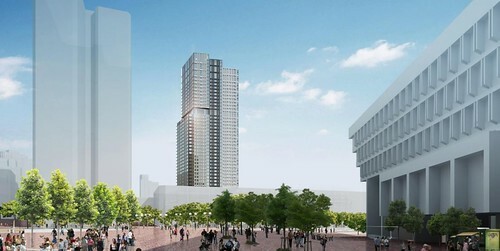 All of the future buildings will be organized around a dynamic public plaza that will connect the Bulfinch Triangle neighborhood, the Rose Fitzgerald Kennedy Greenway and Congress Street. Building permits have been filed for 100 Sudbury street, the west parcel of the project that will include a 45-story, 480-foot-tall luxury residential apartment building. This will be the first structure built and will feature 368 apartments and 55 condominiums for a total of 423 residences. The structure will replace the existing government center garage. with a total construction gross of 610 000 square feet. 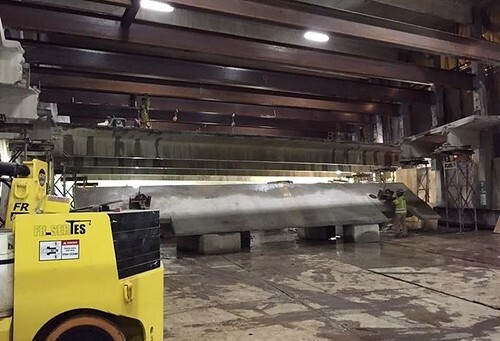 The structure will consist of concrete core columns and post tension slabs. The exterior envelope will consist of glass and metal panel curtain-wall with a TPO membrane roof. The HYM Investment Group and National Real Estate Advisors have secured $250 million in construction financing for 100 Sudbury Street, an under-construction 46-story residential tower that is the first phase of Downtown Boston’s $2 billion, 2.9-million-square-foot Bulfinch Crossing development. The 15-year loan was arranged by Holliday Fenoglio Fowler, L.P. (HFF) through Pacific Life Insurance Company and will allow the 480-foot-tall tower, which will feature 368 apartments and 55 condominiums, to rise. The loan follows a $180 million short-term, floating-rate loan secured for the Government Center Garage property, which Bulfinch Crossing will replace, last summer. The $180 million loan was provided through Oxford Properties Group and arranged by HFF. Demolition of the garage section located at 100 Sudbury Street, which the tower will replace, was recently completed. Work on the tower’s foundation is now underway. The tower will feature amenities including an outdoor pool, three roof decks, a fitness center and yoga studio, a clubroom, a children’s playroom, a golf simulator room, a full chef’s kitchen and an outdoor dog run and dog spa. The tower is expected to open in 2020. The Boston Planning & Development Agency (BPDA) approved The HYM Investment Group’s proposal to add a condominium component to its' upcoming 45-story apartment tower that will be Phase I of the 2.9-million-square-foot Bulfinch Crossing mixed-use development in Bulfinch Triangle. HYM will convert 118 apartments across the top 11 floors of the tower into 55 condominiums, reducing total residences in the tower to 423 from 486 as originally approved. As part of the change, the tower’s 1,300-square-foot ground-floor retail space will be converted into a private lobby for the condominiums. 63 apartments in the tower will be designated affordable. Demolition of a section of the existing Government Center Garage along New Sudbury Street is now underway in order to commence construction of the tower, which is expected to open in 2020. The HYM Investment Group is now proposing to add a condominium component to its' upcoming 45-story apartment tower that will be Phase I of the 2.9-million-square-foot Bulfinch Crossing mixed-use development in Bulfinch Triangle. HYM proposes to convert 118 apartments across the top 11 floors of the tower into 55 condominiums, echoing the Boston condominium market's high demand. "It's pretty straightforward. We want to adjust to the market," said HYM Managing Director Thomas O'Brien in an interview with The Boston Globe. The tower, originally planned to feature 486 apartments, would now feature 368 apartments and 55 condominiums for a total of 423 residences. As part of the proposed change, the building's 1,300-square-foot ground-floor retail space would be converted into a private lobby for the condominiums. HYM has filed revised project plans with the Boston Planning & Development Agency (BPDA) formally proposing the change. The tower, which will replace a section of the existing Government Center Garage along New Sudbury Street, is expected to open in 2020. The Bulfinch Crossing development will construct 800+ residences, 200 hotel rooms, 1.15 million gross square feet of office space and 82,500 gross square feet of retail space at the present garage site. The development’s first phase, a 45-story rental apartment tower featuring 486 residential units, is currently under construction. 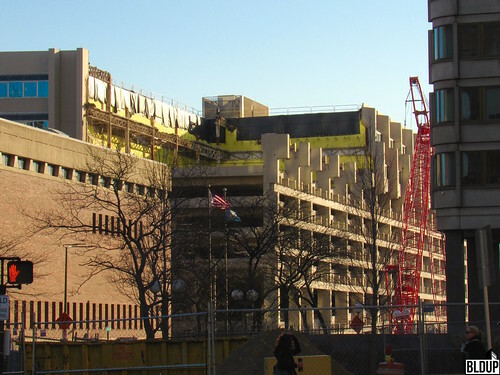 The existing 11-story Government Center Garage, which is actively being dismantled, comprises 1,960 parking space underneath 202,854 square feet of office space. Retail space totaling 23,212 square feet is located on the Garage’s ground floor. An official construction launch was held Tuesday (January 24th, 2017) to kick off construction of Bulfinch Crossing's first phase, a 45-story rental apartment tower featuring 486 residential units. At the launch, Boston Mayor Martin J. Walsh, City officials and members of the Bulfinch Crossing development team ceremonially swung sledgehammers to officially mark commencement of the Government Center Garage's demolition to make way for the Phase 1 tower. A new video of Bulfinch Crossing, which is posted above, was also released at the launch. 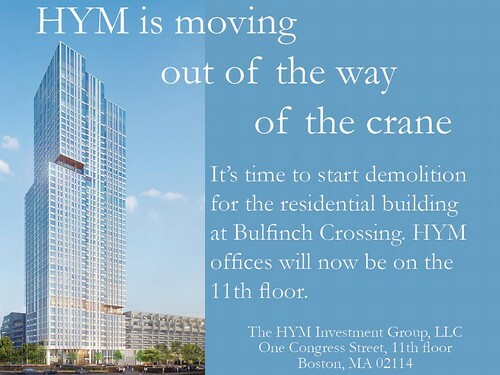 At Bisnow's Future of Downtown Boston panel Tuesday, The HYM Investment Group Managing Director Tom O'Brien announced the Government Center Garage project's rebranding as Bulfinch Crossing. The rebranding pays homage to the Bulfinch Triangle neighborhood's rich history and speaks to the project's emphasis upon urban connectivity. The following is a link to the official press release announcing the rebranding. 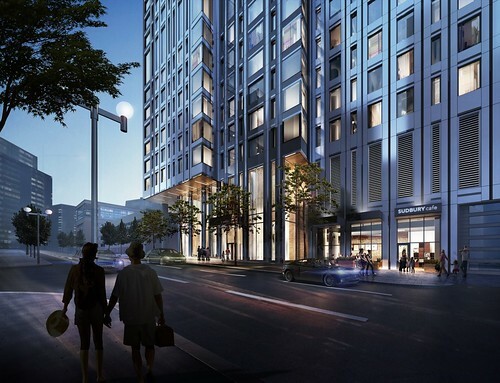 The office tower at Bulfinch Crossing will be known as One Congress. 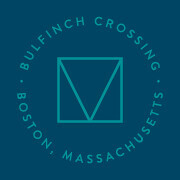 More information about Bulfinch Crossing is posted below. New renderings of Phase One of the Government Center Garage project were released today along with Expanded Project Notification Forms (EPNFs) for Phase One's two proposed buildings. Approved by the Boston Redevelopment Authority in 2013, the project is currently undergoing design review. The development team hopes to start construction in 2016. The first building would be a 480-foot tall, 45-story building with 486 residential units, in addition to ground-floor retail, designed by CBT Architects. Next would be a 528-foot tall office tower designed by CBT and Pelli Clarke Pelli. As part of the multi-phased project, six buildings will be built on the site of the existing Government Center Garage. Sections of the parking garage will be demolished to make way for the buildings; part of the garage will be preserved. The following are links to the EPNFs for the residential and office towers. BOSTON - January 24, 2017 - Today, Boston Mayor Martin J. Walsh, City officials, and members from National Real Estate Advisors and The HYM Investment Group, will swing sledgehammers to mark the launch of construction at Bulfinch Crossing. The project involves strategically transforming the site of an underutilized above-grade parking garage into a 2.9-million square-foot mixed-use development known now as Bulfinch Crossing. With proactive community engagement throughout the design process, Bulfinch Crossing is one of the largest mixed-use development projects ever permitted in Boston. Located at the nexus of some of Boston’s most iconic neighborhoods, the project includes six new buildings – three towers surrounding a 1-acre green rooftop terrace and three mid-rise buildings encompassing a new net-zero public plaza. A large portion of the existing garage will remain but will be wrapped by the new buildings. Bulfinch Crossing will redefine this area and create a new sense of place through thoughtful planning that focuses on adaptive reuse, sustainability, and creating a modern and vibrant “live, work, play” experience. The Government Center Garage at Bulfinch Crossing is one of the most visible remaining vestiges of Boston’s historic urban renewal. This massive above-grade concrete parking garage creates a physical barrier that divides some of the City’s most recognizable neighborhoods. The new Bulfinch Crossing development is specifically designed to reconnect the West End, Bulfinch Triangle, and North End by tearing down 50% of the garage and re-activating the site through ground-floor retail, outdoor dining, and new green spaces. The project is committed to achieving energy efficient building design by commitments to a net zero urban public plaza and one LEED® Platinum, four LEED® Gold, and one LEED® Silver buildings. Forward-thinking shared parking models, electric vehicle charging stations, a 850-space shared bicycle parking facility, and direct access to multiple modes of public transportation are also key aspects of the redevelopment. Demolition of a portion of the garage is no small feat. Strategic engineering and construction techniques enable a section of the garage to be removed while maintaining 24/7 public parking operations throughout construction. 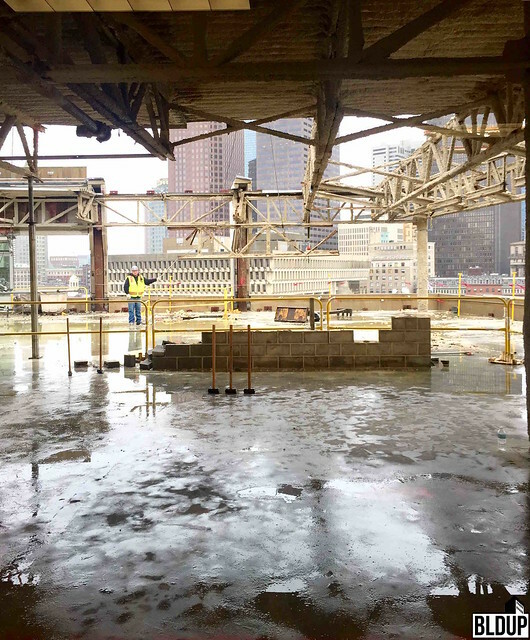 This deconstruction work paves the way for the first phase of new development – construction of Boston’s tallest apartment tower. Designed by CBT Architects, the 480-foot tall, 45-story apartment tower will consist of 486 residential units with spectacular, sweeping cityscape views. It will feature a wide array of unique luxury amenities – ranging from a state of the art fitness facility, golf simulator, chef’s kitchen with private dining, yoga studio, children’s playroom and dog spa – to an outdoor pool overlooking Boston Harbor and two club rooms with roofdeck access – one overlooking Boston Harbor and the Financial District and the second on the 32nd floor overlooking Back Bay, the Charles River and downtown Boston. Demolition for the footprint of the residential tower kicked off in December 2016 with vertical construction commencing in late Spring 2017 and completion expected in late Spring 2020. Bulfinch Crossing also encompasses construction of a 1 million square-foot office tower – One Congress. 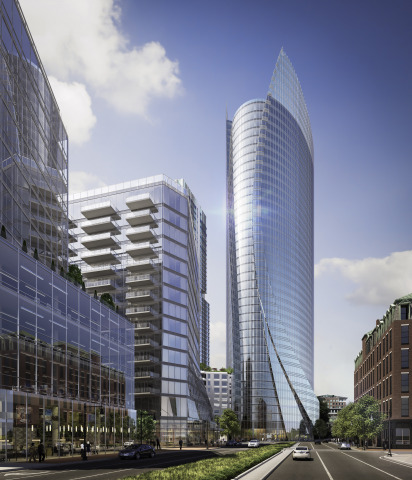 Designed by internationally renowned Pelli Clarke Pelli Architects, One Congress will rise more than 500 feet as not only an iconic anchor of Bulfinch Crossing but also as a compelling addition to the Boston skyline. Tenants at One Congress will have spectacular and uninterrupted views across Boston Harbor, down the Charles River, and as far north as the mountains of New Hampshire. Additionally, the tower’s street level retail and impressive lobby entry will seamlessly enhance the dynamic ground-level pedestrian experience. Transwestern, the exclusive leasing agent, has actively begun pre-leasing efforts for One Congress. Mayor Walsh, elected officials, and community members will celebrate the milestone by swinging at a concrete wall and taking a virtual reality ‘tour’ of the future development. “Bulfinch Crossing exemplifies National’s commitment to transforming urban districts, creating job opportunities and securing investment returns for our clients and partners,” said Jeffrey J. Kanne, President and Chief Executive Officer of National Real Estate Advisors. This early phase of demolition that National and HYM celebrate today alongside Mayor Walsh and community members from around the City marks the construction launch of Bulfinch Crossing. National Real Estate Advisors is a leading investment manager, specializing in build-to-core—developing and owning large-scale, urban commercial and multifamily projects for its institutional client accounts. National constructs investment portfolios of stabilized modern property assets—apartment, office, mixed-use, industrial, data center and hotel—with design features, technological enhancements, and amenities that can drive high tenant demand and create value for investors. The firm is a subsidiary of the National Electrical Benefit Fund. For more information visit, www.natadvisors.com. HYM is focused on creating significant value for investors by recognizing real estate opportunities where others may not. Each real estate asset is treated as a unique business opportunity, and each asset plan seeks to cause the real estate to reconnect, energize and enhance the urban communities of which it is a part. For more than 35 years HYM’s principals have been working on real estate ventures in the Boston, New York and Washington, D.C., corridor. To learn more, please go to www.hyminvestments.com.